What's So Great About Schools in Finland? Screen Shot from Edutopia video "Finalnd's Formula for Success." Monday's Three Things to Unlearn About Learning elicited several comments about Finland's school system. 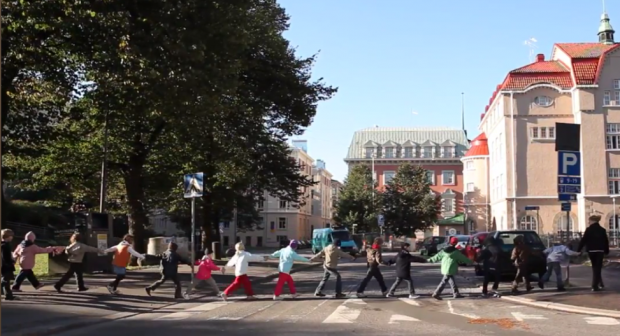 Here's a recent post describing some differences between schools in the U.S. and Finland. Finland has been hailed for exemplifying the ideal model of a thriving, innovative education system that prioritizes the most important stakeholders: students. International and American media are fascinated by the Scandinavian country's approach to designing the education system. The fact that Finland manages to score among the top three countries on the PISA survey is a tribute to its success, and worth following closely, observers say. So what makes the Finland story so compelling? THERE ARE NO PRIVATE SCHOOLS. Technically, there are a few independent schools, but they're financed by the state and don't charge tuition, according to a wildly popular article in the Atlantic about the school system. “The primary aim of education is to serve as an equalizing instrument for society,” said Dr. Pasi Sahlberg, Director General of the Centre for International Mobility and Cooperation in Finland’s Ministry of Education and Culture who was visiting New York. "Here in America, parents can choose to take their kids to private schools. It's the same idea of a marketplace that applies to, say, shops. Schools are a shop and parents can buy what ever they want. In Finland parents can also choose. But the options are all the same." The Atlantic article also notes that all Finnish students receive free meals at school, and have "easy access to health care, psychological counseling, and individualized student guidance." ALL ADMINISTRATORS HAVE WORKED AS TEACHERS. "We have very carefully kept the business of education in the hands of educators. It’s practically impossible to become a superintendent without also being a former teacher," Sahlberg told the Hechinger Report. "If you have people [in leadership positions] with no background in teaching, they’ll never have the type of communication they need." THEY DON'T FOCUS ON TESTS. "Finns don’t believe you can reliably measure the essence of learning," Sahlberg said to the Hechinger Report. "You know, one big difference in thinking about education and the whole discourse is that in the U.S. it’s based on a belief in competition. In my country, we are in education because we believe in cooperation and sharing. Cooperation is a core starting point for growth." To that end, testing doesn't really begin until students are "well into their teens," according to the Times. TEACHING IS A REVERED PROFESSION. "The teaching profession is one of the most famous careers in Finland, so young people want to become teachers," said Henna Virkkunen, Finland’s Minister of Education to the Hechinger Report. "In Finland, we think that teachers are key for the future and it’s a very important profession—and that’s why all of the young, talented people want to become teachers." It's compulsory for teachers to have a master's degree, a process that typically takes five years, and requires intensive supervised teacher-training. THEY TRUST TEACHERS. "Teachers in Finland can choose their own teaching methods and materials. They are experts of their own work, and they test their own pupils," Virkkunen said. "I think this is also one of the reasons why teaching is such an attractive profession in Finland because teachers are working like academic experts with their own pupils in schools." THEY INTEGRATE FOREIGN STUDENTS. Though Finland is primarily a homogenous country, there are pockets where immigrant populations are growing, specifically near Helsinki, where 30 percent are immigrants. "Normally, if children come from a very different schooling system or society, they have one year in a smaller setting where they study Finnish and maybe some other subjects," Virkkunen said. "We try to raise their level before they come to regular classrooms." Finnish schools also try to teach immigrant students' native language as much as possible. "It’s very challenging," she said. "I think in Helsinki, they are teaching 44 different mother tongues. The government pays for two-hour lessons each week for these pupils. We think it is very important to know your own tongue—that you can write and read and think in it. Then it’s easier also to learn other languages like Finnish or English, or other subjects." There are too many divergent factors for that to happen. Finland's population is about 5.3 million, while there are more than 300 million residents in the U.S. But even more importantly, the culture around competition is vastly different. There's a distinct distaste for unabashed competition. "You know, one big difference in thinking about education and the whole discourse is that in the U.S. it’s based on a belief in competition," Sahlberg said. "In my country, we are in education because we believe in cooperation and sharing. Cooperation is a core starting point for growth."